Panel Built Quality Contest Winners! 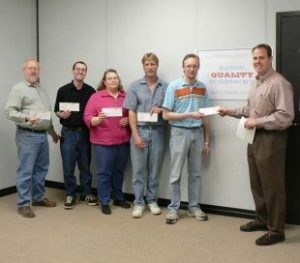 Panel Built proudly awards $1,000 to winners of their recent 2006 Quality Awareness Employee Contest held at their Blairsville, GA facility in the Robert W. Jones Industrial Park. The contest heightened awareness of the importance of quality and workmanship at Panel Built, a local manufacturer of panelized, modular industrial building structures and steel platforms and stair components for commercial, industrial, and military customers. Mike Kiernan, President, offered the prize to the winning team who could best impart the company’s new Quality Awareness Campaign and slogan, “Zero Defects”. The 7 employee teams, totaling over 50 area associates, were given the task to develop a Quality Awareness Campaign complete with posters, banners, slogans, and tools of measurement. Engineering Team members: Terry Breland, Chris Eldon, Ken Carpenter, AnnaMaria Thompson, Josh Wallace with Mike Kiernan. Front left Roy Combs with Mike Kiernan.